Historians tend to overlook the role of musical instruments in the Seven Years’ War. Few devote much attention to explaining how armies operated or battles played-out. Fred Anderson’s Crucible of War, for instance, does a terrific job explaining the origins and unfolding of events, but hardly assesses the experiences of soldiers on the ground. Other writers geared more towards a more popular audience such as Walter Borneman invoke military music to set the scene and add colour, but neglect to stress music’s prominent and indeed integral position in the conflict. In the British and French armies, each company of soldiers was assigned one or two drummers and a fife (a shrill flute-like instrument) player, known as a “Corps of Drums.” The progression of the soldiers’ day began and ended in camp to the sounds of their musical instruments. In the morning the “reveille” roused the soldiers, and in the evening the final inspection of posts was announced with the “last post” or “tattoo.” The military literature of the era emphasizes that from a tactical perspective, the primary function of drummers was to amplify the spoken orders of the commanding officer. In the Duke of Cumberland’s 1757 Exercise of the Foot, each procedure is categorized by its “word of command” and corresponding drumbeat. The orders of “Bayonets to be fixed,” “Shoulder,” “take post in battalion,” “first caution,” “recover your arms,” “to the Right-about,” “march,” “halt,” “order your arms,” and “take care to perform the manual exercise,” are conveyed variously through a “roll upon the drum,” a “flam on the drum,” “a ruffle of the Drum,” or “a troop” on the drum. These rhythms were drilled into European soldiers and colonial militia, and were integral to their maneuvers. Image Courtesy of the New York Public Library, “Great Britain, England, 1743-97.” Image ID: 477350. Drummers and fifers, often referred to in the accounts simply as “drummers,” made up around two percent of the army. 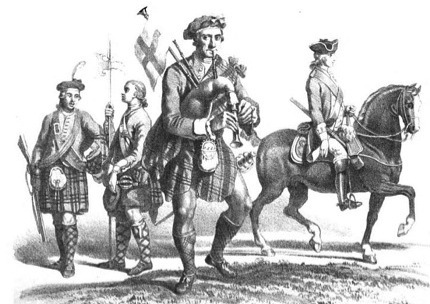 In 1757, the British Secretary of War Lord Barrington ordered the raising of a Highland Battalion “which is to Consist of Ten Companies of Four Serjeants, Four Corporals, Two Drummers, and One Hundred Effective Private Men in each Company, besides Commission Officers…” Here, drummers make up less than two percent of each company. When the 78th Foot disbanded in Quebec in August 1763, their names were taken on subsistence rolls, revealing that the 887 men were divided into 736 “other ranks,” 95 noncommissioned officers, 36 commissioned officers, and 20 drummers. This sample tally comes at the end of six years campaigning in North America, with drummers representing 0.0225 or 2.25% of the total force. 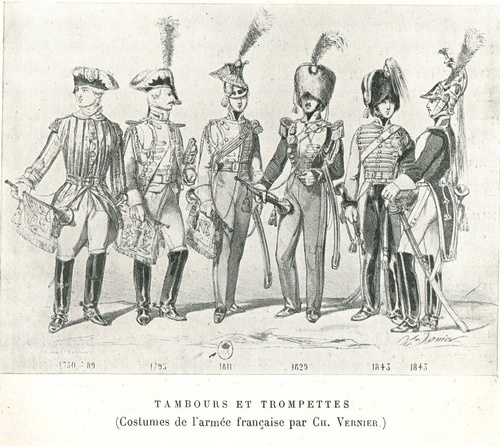 The recommended number of drummers was higher, as Langley’s manual from 1794 suggests that there should be one drummer for each company of thirty privates, three officers, two sergeants, and three corporals, or approximately 2.56% of each company. Wearing yellow and gold stripes or the inverse of the regiments’ colours, drummers and fifers were visually distinguished from the group. Their distinctively bright apparel both made them easy to spot and highly vulnerable targets. During the Seven Years’ War military drummers made four pence more per day than private soldiers and were classified as non-commissioned officers. They served such an important link in the chain of command that it was crucial they be replaced when lost in action. On the New York frontier, Colonel Johnathan Bagley wrote on November 27th, 1755 to William Johnson to “Send Up [a] Good Drum[m]er” to fill the position of Drum Major, and “if to be had” two more drummers. Johnson’s correspondence indicates numbers of British casualties in battle, including a number of “missing” drummers. Not only personnel, but equipment had to be replaced after falling to the enemy. Nathan Whiting reported to Johnson on October 28th 1755 that his regiment lost seven guns, four swords, four horns, and one drum in the Lake Champlain region to the French and their Indigenous allies. Some of these instruments were likely brought back to Canada as trophies of war. Michel Brenet, La Musique Militaire. Collection des Musiciens célèbres. Henri Laurens, éditeur. Paris, Librairie Renouard, 6, rue de Tournon. No date (19th century). Archibald K. Murray, History of the Scottish Regiments in the British Army (Ward, 1862). Public domain. Military musicians and their instruments were crucial to the experiences of soldiers and the outcome of battles in the Seven Years’ War. They were the vital conduits of social control, loudly broadcasting the orders of the commanding officers. This military structure was not employed by First Nations warriors, whose alliance was greatly coveted by both sides of the conflict, and whose tactics often relied on stealth and surprise. The major battles of the war in North America utilized standing armies with military musicians. Drums, fifes, and bugles sounded in camps and while marching, and contributed greatly to the din of battle. 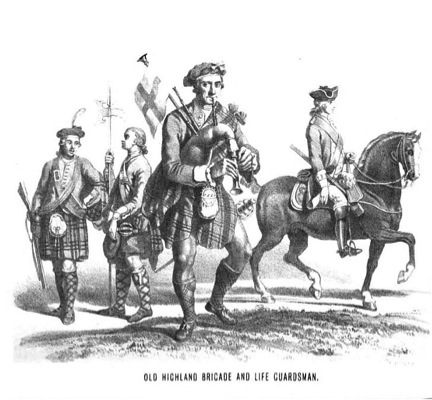 Bagpipes proved their utility and were employed in subsequent conflicts by the British army. The prominence of military musicians would decline over the following century and a half, as armies changed their tactics with more powerful weaponry and mechanization. Yet in the Seven Years’ War, military instruments were integral because they allowed the officers to command and maneuver armies of many thousands of men. While the marching tunes were often cheerful, the enormous death and destruction wrought by the conflict was anything but; beyond the tens of thousands killed and wounded, entire towns such as Quebec were virtually destroyed and had to be rebuilt. Military instruments were part of the cacophony of destruction, shaping experiences of the war as well as the subsequent musical culture of Canada. Daniel Laxer graduated from the University of Toronto in 2015 with his dissertation “Listening to the Fur Trade: Sound, Music, and Dance in Northern North America, 1760-1840,” which he is now editing into a book. An historian and musicologist of colonial North America and early Canada, you can check out his blog “Listening to Canada” and find him on Twitter @DanielLaxer. Exercise for the Foot: With the differences to be observed in the Dragoon Exercise 1757: By Order of H.R.H. Prince William Augustus Duke of Cumberland, etc., A Plan of Discipline Compiled for the use of The Militia of The County of Norfolk 1759, Historical Arms Series No. 42 (1759, reprinted; Bloomfield & Alexandria Bay, Museum Restoration Service, 2004), 12-15. James Thompson, A Bard of Wolfe’s Army: James Thompson, Gentleman Volunteer, 1733-1830 , edited by Earl John Chapman and Ian Macpherson McCulloch, (Montreal: Robin Brass Studio, 2010), 111. Serjeant Thomas Langley, 1st Royal Regt. The Eighteen Manoeuvres for His Majesty’s Infantry, 1794 (1794, reprinted; Hemel Hempstead: Bill Leeson with permission of the British Library, 1988), 21. Brumwell, Stephen. Redcoats: The British Soldier and War in the Americas, 1755-1763 (Cambridge: Cambridge University Press, 2002), 101. William Johnson, The Papers of Sir William Johnson, University of the State of New York, 1921-1965, vol. IX, (Albany: The University of the State of New York, 1939), 325. Robert M. Barnes, The Uniforms & History of the Scottish Regiments: Britain-Canada-Australia-New Zealand – South Africa: 1625 to the Present Day (London: Seeley Service & Co. Limited, 1956), 99. T.H. Cooper, A Practical Guide for the Light Infantry Officer: Comprising Valuable Extracts from all the most Popular Works on the Subject; with Further Original Information: and illustrated by A set of Plates, on an Entire New and Intelligible Plan; which simplify Every Movement and Manoeuvre of Light Infantry (1806, reprinted; London: Redwood Press, 1970), 98. Francis Parkman, Montcalm and Wolfe, vol.1 (Boston: Little, Brown, and Company, 1891), 248. Barnes, The Uniforms & History, 261. James Thompson, A Bard of Wolfe’s Army, 198. While this topic lies outside the immediate focus of this essay, it is important to acknowledge that First Nations’ military tactics, especially the use of silence in stealth and ambush, and the use of loud “war whoops” on engaging in hand-to-hand combat, play a prominent role in the war precisely because they were often so devastatingly successful against the regular and militia regiments. Featured Image: Archibald K. Murray, History of the Scottish Regiments in the British Army (Ward, 1862). Public domain. The Early Modern Maritimes Recipes Database, Part I: What is a Recipe?